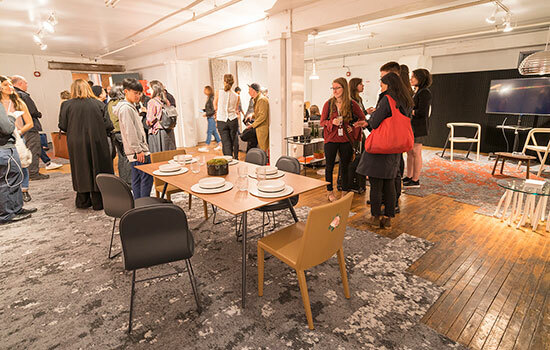 Four interior design students, under the leadership of RIT interior design professor and program chair Mary Golden, curated an Italian modernism-inspired living space for WantedDesign's Wanted Interior exhibit during NYCxDESIGN. Dozens of Rochester Institute of Technology students, faculty and staff left New York City exhausted yet inspired after the university’s most ambitious presence ever at NYCxDESIGN—the Big Apple’s sixth-annual celebration of design. Scores of visitors crowded into the university’s seven exhibits and events showcased in Brooklyn and Manhattan throughout Design Week from May 16 to 23, seemingly in awe of the multidisciplinary design efforts aimed at making a difference around the globe. “This year’s NYC Design Week was by far our most creative and ambitious yet—expanding beyond our previous years’ regular industrial design presence with works from several other RIT disciplines, including interior design and engineering,” said Josh Owen, professor and chair of the industrial design program in RIT’s College of Imaging Arts and Sciences. RIT was among only a select few universities and design schools invited to this year’s Design Week. The university’s massive presence began May 16 with a pair of featured exhibits at WantedDesign Brooklyn in Industry City, founded in 2013 amid the sprawling 21st-century reconstruction of the former Bush Terminal. The Hope for Honduras initiative, directed by Mary Golden, assistant professor and chair of RIT’s interior design program in the School of Design, highlighted the partnership between Herman Miller and the interior design program to outfit a 12,000-square-foot expansion of the neonatal intensive care unit (NICU) at Hospital Escuela, the largest public hospital in Honduras. The exhibition curated work from a multidisciplinary effort, including designers and Kate Gleason College of Engineering students, aimed at providing an accessible model of medical care for critically ill newborns with the goal of reducing infant mortality. The booth featured a detailed mock-up of a neonatal ambulance designed to provide safe, emergency transportation for critical-care infants from regional hospitals to Hospital Escuela for treatment in a specialized NICU. Directly adjacent to the Hope for Honduras exhibit was a selection of unique textile products created over the last few years in the Soft Studio classes of Melissa Dawson, assistant professor of industrial design at RIT. The designs featured soft goods produced in a wide variety of categories, from healthcare and footwear to toys, outerwear and wearable technology. Visitors also were drawn to Dan Gabber’s porcelain fabric bowl, created during a yearlong independent study with Dawson exploring the combination of textiles and ceramics. Gabber is a 2017 industrial design alumnus from Summit, N.J., who is currently pursuing an MFA in ceramics at RIT in the School for American Crafts. The exhibit was co-curated by Owen. During the next night’s Iterations & Connections event, RIT’s graduate ID program showcased the results of a spring-semester partnership exploring 3D printing with Makerbot, an American desktop 3D printer manufacturer company headquartered in Brooklyn, and Autodesk, the San Francisco-based corporation widely recognized as the company behind the ubiquitous design software AutoCAD. The collaboration, led by Stan Rickel and Alex Lobos, both associate professors of industrial design, explored how CAD and 3D printing can be used to quickly fabricate design concepts. Crowds swarmed around the creative products during the event held at Makerbot’s Brooklyn headquarters. WantedDesign Interiors, also led by Golden, featured the unique living space “Archivio” within the decor of the Terminal Stores Building in Manhattan from May 19 to 22. The exhibition referenced the classic attributes of Italian Modernism, referencing iconic design from past and present, while welcoming visitors into an environment that was both a product showcase and entertainment venue. Envisioned by RIT’s interior design program and supported by partnerships with Cappellini, Flos, Alpi, Mohawk and Artefacto, the space “inspired guests to uniquely experience design products and to engage with brands in a more intimate and lively way,” Golden said. At the 30th annual International Contemporary Furniture Fair, RIT celebrated the eighth iteration of Metaproject, a senior design studio taught by Owen, that challenged 17 students to reimagine the dining experience through the lens of industrial design and co-creation with industry partner and industrial design alumnus Chuck Cerankosky ’03, who allowed industrial design and interior design students to use his Good Luck restaurant in Rochester as their lab. “My evening at ‘Designing Dining’ was a fascinating journey. It defied my expectations of what a student project could be,” said Jane Cook, chief scientist from Corning Museum of Glass after experiencing the meal that was conveyed at Design Week with a video by Alex Freeman, a 2012 industrial design alumnus. Meanwhile, Table as Landscape employed Turnstone’s new Bassline table as a platform for experimentation as 12 graduate students from RIT’s industrial design program explored the physical and metaphysical attributes of this mutable table. The showcase was guided by the table’s designer Mark McKenna together with Owen. Near the conclusion of Design Week, RIT highlighted a philanthropic collaboration between the extraordinary pairing of world-renowned designers Owen and the late Wendell Castle. 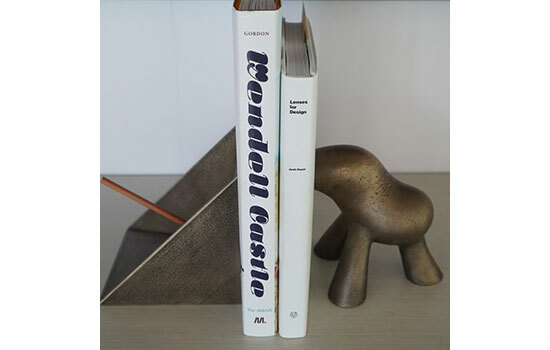 Titled Support for Knowledge, the project resulted in the creation of limited-edition bronze bookends that were unveiled at Steelcase’s offices in Manhattan. A partnership with RIT’s Shop One2, Borough Furnace and Autodesk, the effort’s sales will be used to further grow RIT’s internationally recognized industrial design program. “This is what Design Week is all about: education, culture and commerce combined,” he concluded. 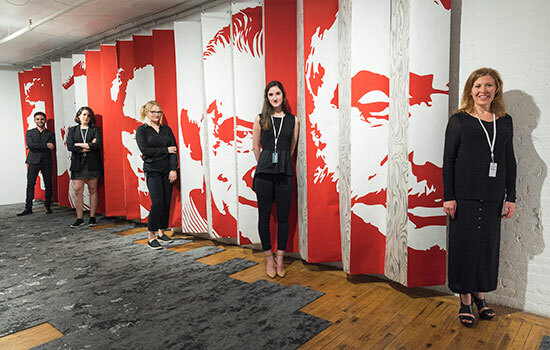 A panel wall featuring iconic designers who inspired the look and feel of the WantedDesign Wanted Interiors space curated by an RIT interior design team. The team, from left: Chris Beckley, Marlee Vlassis, Stefani Schultz, Samantha Oâ€™Neill and Mary Golden. The designers on the wall are Ettore Sottsass, Giulio Cappellini, Massimo Vignelli, Achille Castiglioni and Jason McClennan.